NEW YORK, April 16, 2018 /3BL Media/ - American Express (NYSE: AXP) will host its fourth annual Leadership Academy Global Alumni Summit in New York on April 16 and 17, celebrating eleven years of a transformative program that has developed more than 3,600 nonprofit and social purpose leaders. Seventy-two distinguished program alumni from around the world will have the opportunity to discuss best practices and participate in workshops with eleven premier leadership development organizations, including The Aspen Institute, Ashoka Changemakers, Center for Creative Leadership, Common Purpose, and Independent Sector. The Summit offers nonprofit leaders a unique professional development opportunity with access to information, insights and networking. Produced in partnership with Atlas Corps, the Summit will feature a variety of workshops and panel discussions designed to grow participants’ networks, enhance their leadership skills, and discuss key challenges facing nonprofit organizations. 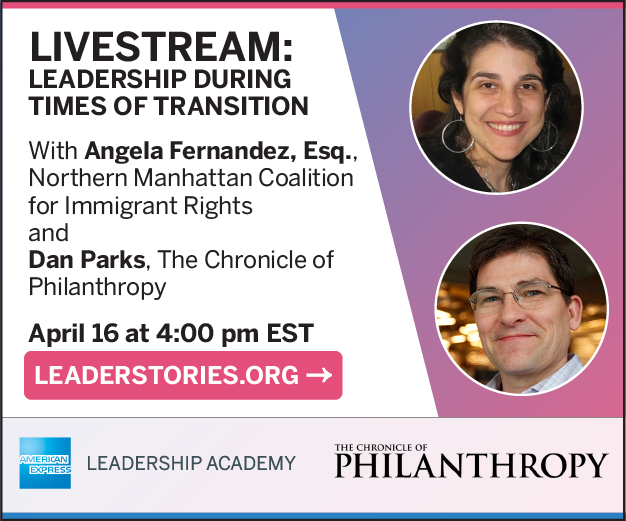 A special session on Leadership During Times of Transition, featuring Angela Fernandez, Esq., executive director and supervising attorney of the Northern Manhattan Coalition for Immigrant Rights, and moderated by Dan Parks, managing editor of The Chronicle of Philanthropy, will be streamed live via LeaderStories.org on Monday, April 16 at 4:00 p.m. (ET). Fernandez will share insights from her more than two-decades of experience advocating for human and civil rights around the world, including top-level governmental and nonprofit community work. The livestream is open to the public, and participants will have the opportunity to ask Fernandez questions in real-time via Twitter, using #amexleads. An exclusive live preview of the conversation will also take place on The Chronicle of Philanthropy’s Facebook page at 2:15 p.m. (ET) that same day. The Summit attendees include world-class leaders tackling some of society’s most complex issues, influencing sectors ranging from education, the arts, social services, health, the environment and more. Notably, the recipient of the 2018 American Express Leadership Academy Alumni Award will be announced during the above-mentioned livestream. This Award recognizes an Academy alumnus or alumna who consistently demonstrates strong leadership while significantly impacting their community, and it includes a $25,000 grant to the recipient’s organization. More information about the nominees, as well as the biographies of all 72 participating alumni, can be found here. The American Express Leadership Academy was founded in 2008 in partnership with the Center for Creative Leadeship, and has since grown from a single, New York-based program for 24 participants to an international movement, encompassing 11 Academy partners and 20 programs across nine countries. To date, American Express has hosted over 110 Leadership Academy sessions, trianing more than 3,600 nonprofit and social sector leaders in Canada, Germany, Hong Kong, India, Japan, Kenya, Mexico, Senegal, Singapore, the United Kingdom and the United States. One of American Express' three philanthropic platforms is Developing New Leaders for Tomorrow. Under this giving initiative, which recognizes the significance of strong leadership in the nonprofit and social purpose sectors, American Express makes grants focused on training high potential emerging leaders to tackle important issues in the 21st century. More than 70,000 emerging nonprofit and social sector leaders worldwide have benefitted from American Express leadership programs, including the American Express Leadership Academy among others. Launched in 2008, the American Express Leadership Academy addresses the growing need of leadership development programs in the nonprofit sector by bringing together emerging leaders from a diverse set of nonprofit, social sector and non-governmental organizations. For leadership journey stories and additional resources, visit LeaderStories.org.